Parents today are busy with jam-packed calendars and balancing the commitments of home, work, and children. We look forward to summer break to ease our hectic schedules. Make the most of your free time this summer by bringing your children to visit their grandparents. If your parent(s) are living in an assisted living community, there are plenty of ways to share quality time together. Share a meal together. Most assisted living communities allow residents to bring guests for a meal. We suggest that you call the community to find out what time meals are served and to reserve a spot with your loved one. Since summer allows for more flexibility, perhaps meeting for breakfast would be a fun way to start your day. Or dine al fresco for lunch or dinner on the patio to enjoy a warm afternoon or evening together. Also, dining with an elderly loved one is a good time for your youngsters to practice their table manners. Enjoy the outdoors. With the sun shining and warmer weather, go outdoors! Enjoy the grounds of the community, assist with weeding in the garden, walk the dog together, or take your loved one to a local park. Bring a game of croquet, a bottle of bubbles, or a ball to toss. Remember to bring sunscreen, hat, and sunglasses for the grandkids and grandparents. Share a community activity. Our Life Enrichment Directors plan daily activities and special outings for our residents all year long. Many of the crafts, exercise programs, games, and day trips may appeal to grandchildren as well. We suggest that you contact the community to coordinate participating in an activity. Also, don’t forget to inquire if there are any costs that need to be covered or special arrangements for your family to participate. 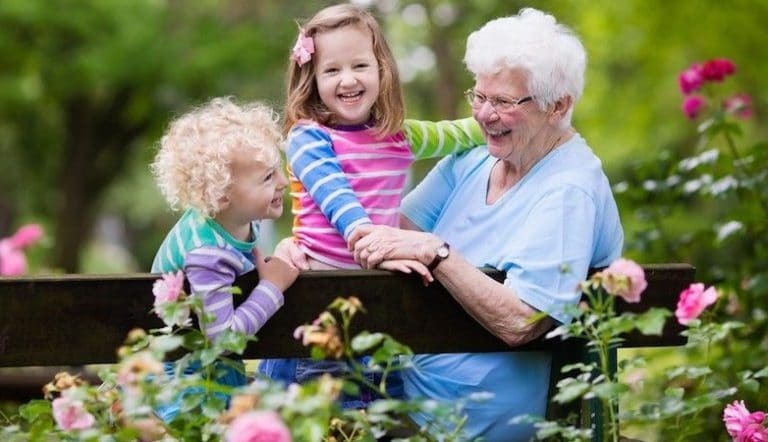 Not only will the grandparent love to show off their grandchildren, but also the other residents can benefit from the energy and enthusiasm of your children. Show and tell. Just like in your school days, have your child bring a favorite object to the community to present with a short story. Encourage your parent to do the same. Shared objects can be a great way to communicate with a child. In fact, you may learn something new from these stories! Board games and cards. There is no age limit to playing a game. For small children, keep it simple like Go Fish or Memory. Older children may benefit from learning more difficult games like chess or bridge from a grandparent. Perhaps bring a game from home (with all the pieces) that your child only plays when visiting their grandparent. This special game will give them both something to look forward to playing when they meet. Coloring. The craze of coloring for adults has really taken off in popularity. There are plenty of fun and creative coloring books on the market that are now age appropriate from ages 3 to 99. Gather your crayons, pens, pencils, and coloring books for an afternoon of art. Coloring is an easy, no mess project that grandparents and kids can share and enjoy together. Summer break is a great time to create fond memories for your children of their grandparents. It is also a slower time in your typically packed and fully scheduled year to take some additional time with your loved ones. It is important that your aging loved ones feel connected and have an active role in the lives of their grandchildren.